1. Place unsalted butter and 5-6 rosemary sprigs in small saucepan over medium. 2. Cook until simmering, almost burnt and brown in color. 3. Remove from heat, strain and allow butter to cool in the fridge. 2. Grease and Line a 10x15x1 pan. 3. Beat egg yokes and half of the sugar together until pale. 4. Combine and sift flour, cocoa, salt and baking powder. 5. Mix with egg yoke mixture. Set aside. 6. With a clean whisk and bowl, beat egg whites on medium until soft peak. 7. Gradually add the remaining 1/3c sugar. 8. Beat on high until stiff peak. 9. Fold egg whites into batter. 10. Place in prepared pan. 11. Bake for 11-12 minutes. 12. Let rest 5 minutes in pan and then turn onto clean kitchen towel sprinkled with cocoapowder. 13. Roll into jellyroll form and let col on wire rack. 1. Place brown butter in a stand mixer fitted with a whisk attachment. 2. Beat until pal and fluffy. 4. Mix to combine, then on medium until soft peak. 5. Gradually add sugar and extract. 6. Mix on high until stiff peak. 1. In the bowl of a stand mixer fitted with a whisk attachment, cream together butter,vanilla, glucose and almond extract, until well incorporated and light in color. 2. Beat in. heavy cream. 4. Add powdered sugar, once combined, mix on high speed until fluffy. 2. Place mold in freezer until set. 3. Trim and brush a small amount of melted chocolate on to assemble the halves. 6. 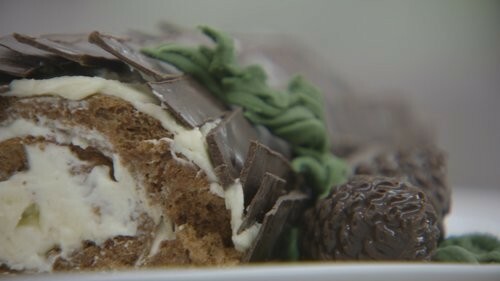 Allow chocolate to set and then break into long pieces that can later be assembled into the buttercream to create a bark pattern. 7. Using the fondant, form the fondant into needles and form small pine looking branches that will later be painted with the food coloring. 1. Unroll cake from towel. 2. Spread filling evenly, about ¾ in from edges. 3. Roll cake and set aside. 4. Trim if needed to even edges. 5. Ice cake with buttercream on sides, leaving ends exposed. 6. 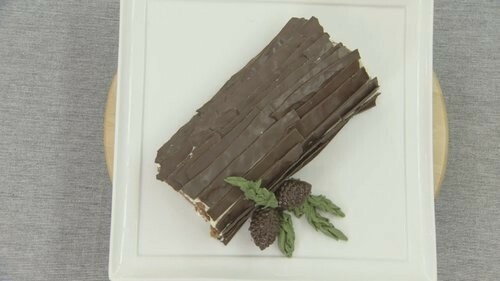 Using the shards of chocolate, lightly press them into the buttercream to create a bark pattern. 7. Arrange the pinecones and painted fondant branches. 8. Dust with powdered sugar.